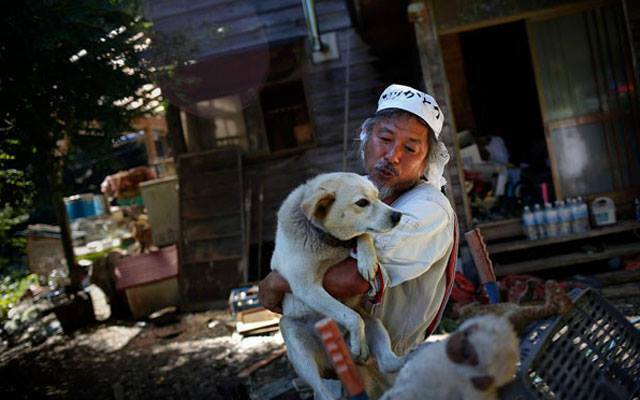 Keigo Sakamoto, 58, holds Atom, one of 21 dogs and over 500 animals he keeps at his home in the exclusion zone near Naraha in Fukushima prefecture, on Sept. 17, 2013. PLEASE ~ CLICK HERE to send a DONATION to KEIGO SAKAMOTO. Keigo Sakamoto, a farmer and former caregiver for the mentally disabled, is considered a lunatic by some and a hero by others, Sagolj says. 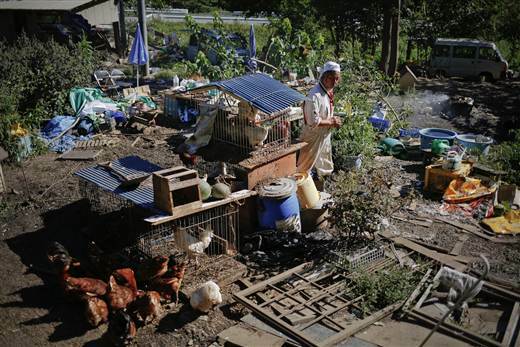 Sakamoto refused to evacuate, stayed inside the zone and made animals his mission. He ventured into empty towns and villages and collected a veritable Noah’s Ark of animals — dogs, cats, rabbits, chickens, even marmots — abandoned by former owners when they left. Sakamoto walks between the cages where he keeps some of the animals. As he visited the area around Japan’s stricken Fukushima nuclear plant last month, photographer Damir Sagolj saw towns and villages that had been abandoned and met people whose lives had been irrevocably changed by the disaster of March 11, 2011. Inside the exclusion zone around the plant, Sagolj found a scene he likened to “a silent horror movie.” But amidst the carnage and the deserted houses he found one man who had defied the order to leave. Sakamoto lives with more than 500 animals in his mountain ranch near Naraha, in a scene Sagolj says is more reminiscent of experimental theater than modern Japan. It’s a very noisy theater too, because many of the dogs have gone wild from the time they spent alone before Sakamoto rescued them. As if to confirm this observation, one dog bit Sagolj hard as he passed. “There are no neighbors,” says Sakamoto. “I’m the only one here but I’m here to stay.” Of his 21 dogs, only two are friendly to man. One is called Atom, a super-cute white mutt, named because it was born just before the nuclear disaster struck. 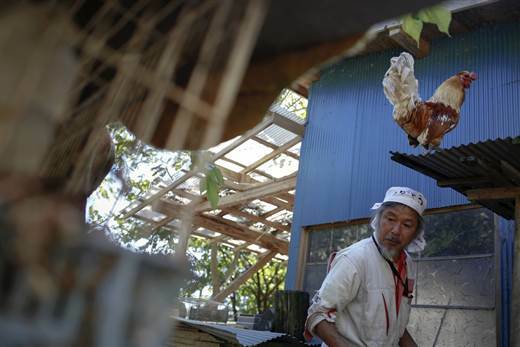 Keigo Sakamoto, 58, feeds his animals. Posted on February 21, 2014, in Fund Raising For Animals Emergencies. and tagged Fukushima, Keigo Sakamoto. Bookmark the permalink. Leave a comment.